What Is DD Form 215? DD Form 215, Correction to DD Form 214, Certificate of Release or Discharge from Active Duty is a supplement to the DD Form 214 with any corrections that had been requested by a veteran and approved by a review board. The latest version of the form - commonly referred to as VA Form DD 215 - was released by the Department of Defense (DoD) in 2009. As of today, no DD Form 215 fillable copies are available for download online. The Executive Services Directorate website has also marked the form as Controlled. A printable version on the form is available for reference below. Accurate discharge documentation is critical to assist Veterans and their family members in establishing eligibility for benefits, compensation, healthcare, home loans, education, tax benefits, and much more. How To Get a DD Form 215? 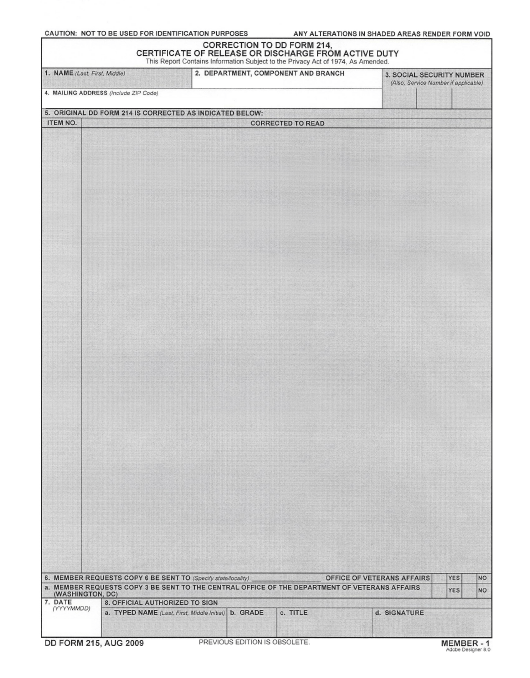 Submit DD Form 149, Application for Correction of Military Records to the relevant service branch. Submit DD Form 293, Application for the Review of Discharge or Dismissal from the Armed Forces of the United States to the relevant service branch. It is important to understand that DD Form 215 should NOT be filled. The form is a supplement to the Certificate of Release or Discharge from Active Duty, which is issued after the request for update information in the certificate itself and contains that updated information. Once you have decided to make corrections to your Certificate of Release or Discharge from Active Duty (DD Form 214), you have to submit your corrections on the DD Form 215 in written form. Your request must include additional information about the things you think are incorrect. Usually, this includes copies of documents that confirm the proposed changes. Please pay attention that your personal data does not apply to "archival" records. A record is considered to be "archival" 62 years after suspension, retirement, or death in service. Your application can be provided in letter format with a date and signature or via a Standard Form 180. Send your application to: Commander U.S. Army Human Resources Command ATTN: AHRC-PDR-H/Dept 420 1600 Spearhead Division Ave Fort Knox, KY 40122.